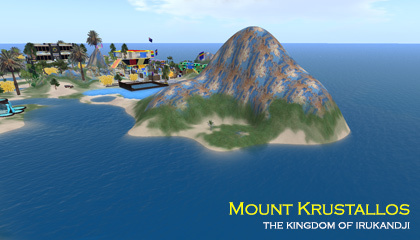 Mount Krustallos in western Irukandji is a tall blue mountain surrounded by sea, connected to neighbouring Hephaistion by a broad spit. Although nothing like its snowy namesake from the Khataria novels, it was intended to be the first of a series of Khatarian themed sims that never eventuated. For several months, Mount Krustallos served as home to a single land-owner who built a modest house on a secluded northern beach. 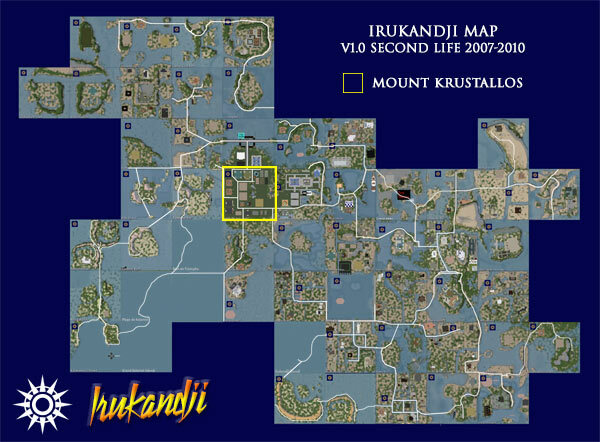 After a number of transformations, the sim was eventually renamed Split Rock Mountain and terraformed to accommodate the Royal Irukandji Naval Base ahead of our invasion of the French-held Kalamat territories to the west. Neighbouring regions were Arms of Patroklos, Hephaistion, and Crystal Atolls.